: American Collection, purchased New York art market, 1995. 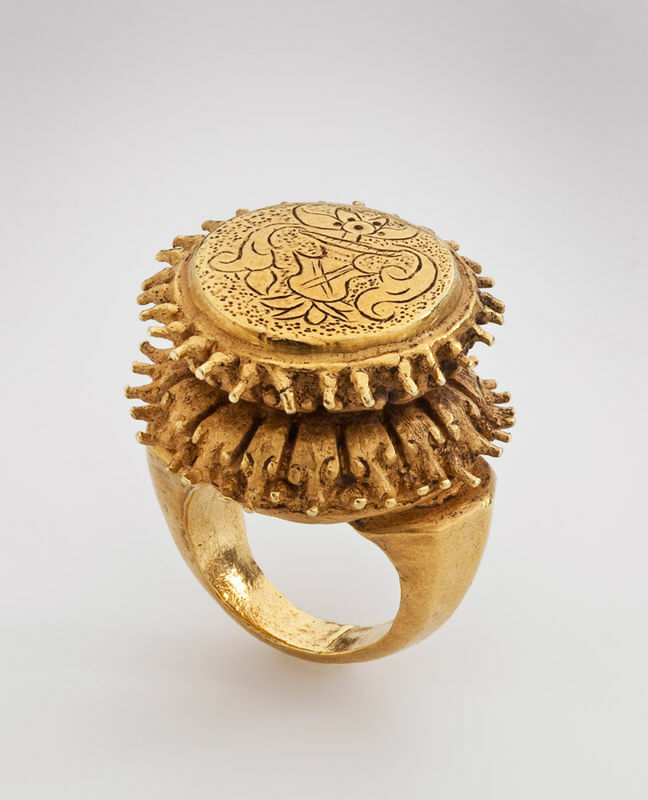 A gold ring with a cast band, enlarged at the shoulders, and decorated with stylized floral motifs with central nagas, finished with a row of granulation in an oval shape to accommodate the bezel, which is elaborately formed with a cast moulded flange secured with two rows of coiled gold wire, and a repoussé gold base. 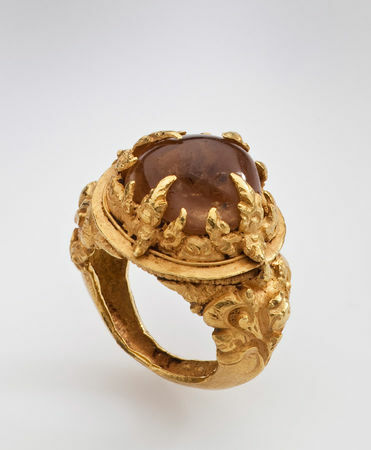 The ring is set with a yellow colored carnelian held in place by four claws in the form of highly stylized nagas. 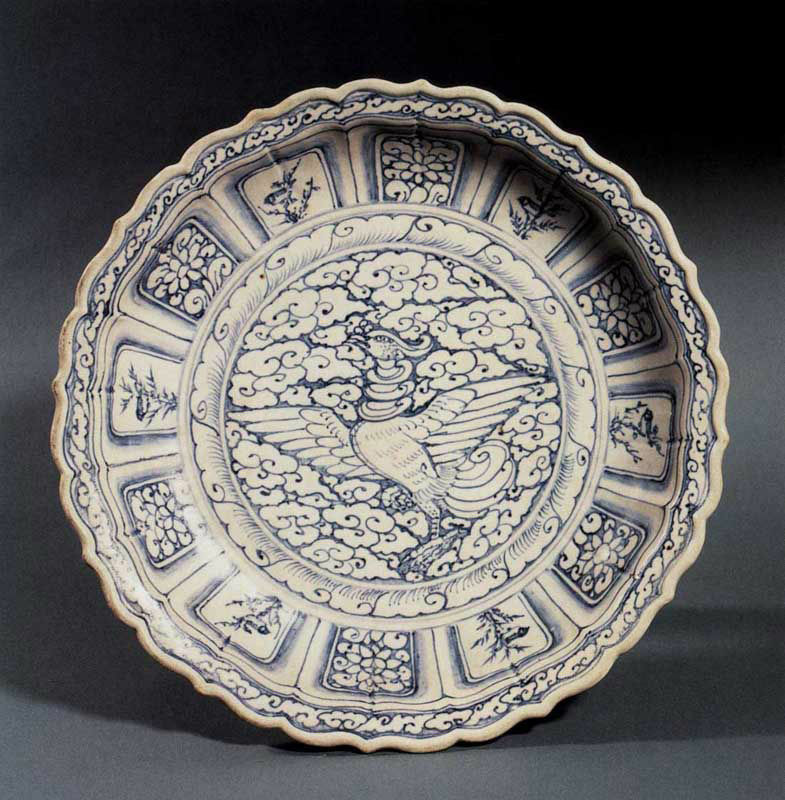 Compare to an example in The Metropolitan Museum, New York, accession number 1998.544.332. 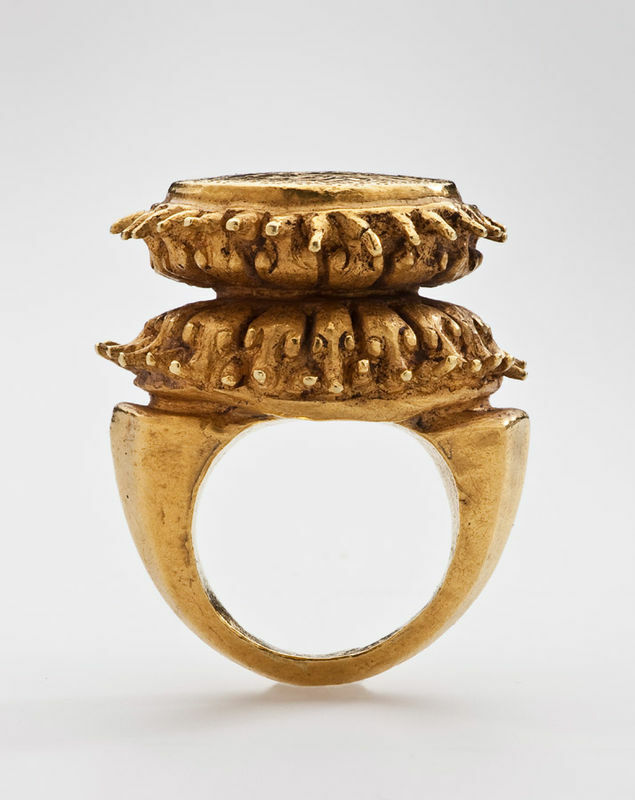 Provenance: American Collection, purchased London art market, 1999. A gold ring with a large stylised lotus design, the bezel consisting of a round flat surface representing the characteristic receptacle with tiny circular holes, which are the stigmas, incised with a crest-like lotus pattern (the Sri motif, a symbol of good fortune), surrounded by two arrangements of petals each beautifully crafted and curved to form one row facing upwards, and the lower row facing down towards the plain, fluted band. 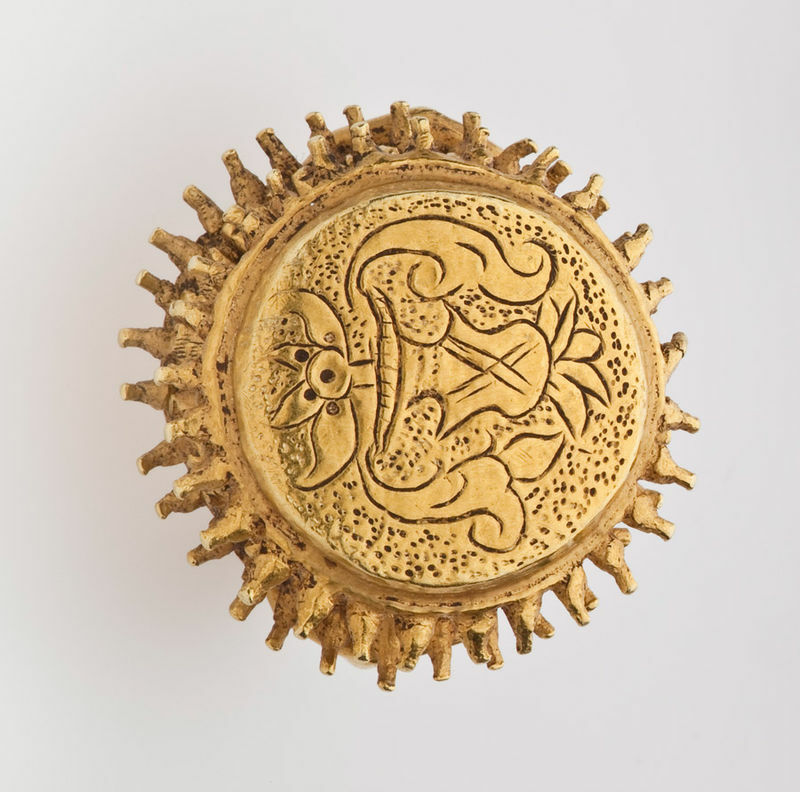 The sacred lotus is an incredibly beautiful and highly sophisticated ancient plant extensively used in Buddhist iconography. 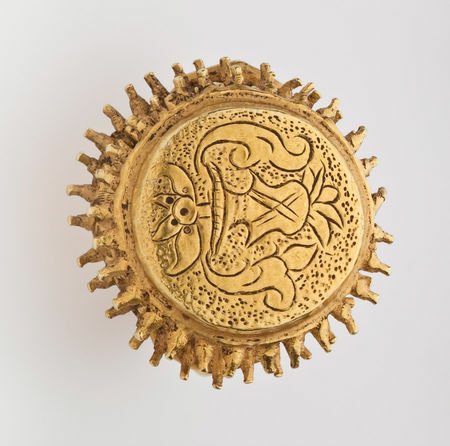 It lives in water and as the plant matures the petals become inverted cones shapes and are held above the surface, which the artist is endeavouring to emulate here. The large size and quality of craftsmanship would indicate that the ring was intended to be worn by royalty or someone of high office, or may have adorned the sculpture of a major deity. 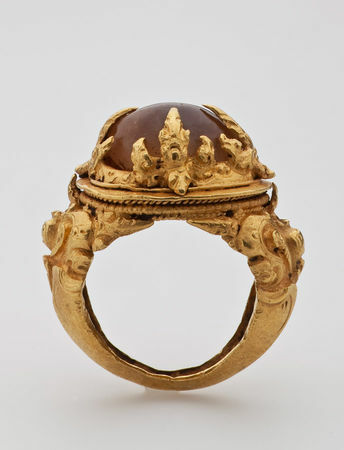 Compare to a similar example in The Metropolitan Museum, New York, accession number 1998.544.444.